Anxiety disorders affect millions of Americans. Anxiety is defined as a psychological state that is characterized by the intense, persistent feelings of worry, tension, and nervousness. Social anxiety disorder is a type of anxiety that is defined as the overwhelming fear of being embarrassed in public. Social anxiety can be triggered by excessive stress, and it can interfere with daily life and the ability to maintain relationships. Social anxiety disorders tend to develop during the teen years and can worsen over time. This article focuses on the common symptoms of social anxiety disorder. Social anxiety disorder, also known as social phobia, is characterized by intense, self-conscious feelings in everyday social situations. People with social phobia have a strong fear of being watched and judged by others. They get embarrassed easily and have trouble facing social situations like public speaking, eating and drinking in front of others, and talking to people, especially strangers. Causes of social anxiety disorder can range from anything like stress and genetics to previous emotional trauma. However, the leading cause of anxiety in women is hormone fluctuations experienced after puberty. In fact, women are twice more likely to develop anxiety disorders than men. 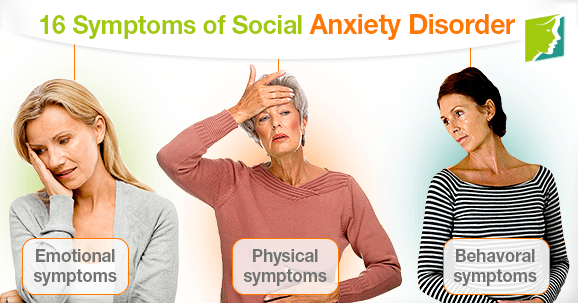 Common symptoms of social anxiety disorder can be divided into emotional, physical and behavioral symptoms. A few helpful treatments to try in order to prevent anxiety symptoms include exercising regularly, trying herbal remedies, eating healthy, and seeking professional help. Walking, yoga, and swimming are excellent low-intensity workouts that can help improve mood, reduce stress, and increase energy. Valerian, kava root, and passion flower are sedative herbs that have been known to reduce anxiety symptoms. Read about helpful social anxiety tips. Social anxiety disorder is defined by amplified self-conscious feelings in everyday social situations, like talking to people and eating in public. Statistically, anxiety disorders occur two times more in women than in men. Symptoms usually worsen once they start, because they feel like everyone is watching them. Social anxiety is manifested by extreme shyness and discomfort in social settings. Seeking professional help is recommended in order to get properly diagnosed and find out which treatment is best for you.